Which Drugs Are Abused by Hispanics/Latinos? How Is This Group Affected by Substance Abuse? Why Does This Group Abuse Substances? Why Do Some Hispanics/Latinos Have Trouble Accessing Treatment? What Are Some of Their Special Needs in Treatment? What Types of Rehab Programs Are Available? What Are the Payment Options for Rehab? Age, trauma exposure, and acculturation may all contribute to addiction in Hispanics. Lack of insurance, fear of deportation, and language barriers can make it hard for them to get help. Finding bilingual recovery programs that involve family members can increase the likelihood that Hispanics will engage in treatment. Family history of substance abuse problems. Addiction may have a genetic component, and having a family history of substance abuse can increase the likelihood that a person may develop a similar problem. Being unable to control drug or alcohol use. For example, people may drink more than they intended or use drugs more frequently than they say they will. Disregarding important activities. People with an addiction may ignore activities they previously enjoyed or withdraw from social contact. Increased risk-taking behaviors. People with an addiction may engage in unsafe or risky behaviors (such as driving while impaired). Relationship problems. People may act aggressively toward loved ones who try to confront them about their addiction. They may also behave unpredictably and have more frequent altercations with friends and family members. Deteriorating appearance. People with an addiction may neglect hygiene and appear unkempt. Tolerance. This means that a person requires more frequent or increased amounts of a substance to obtain the desired results. Withdrawal. People may experience physical and psychological symptoms, such as tremors, insomnia, or depression, if they try to stop using. So they continue to use as a way of avoiding withdrawal symptoms. Lack of insurance and ability to pay. 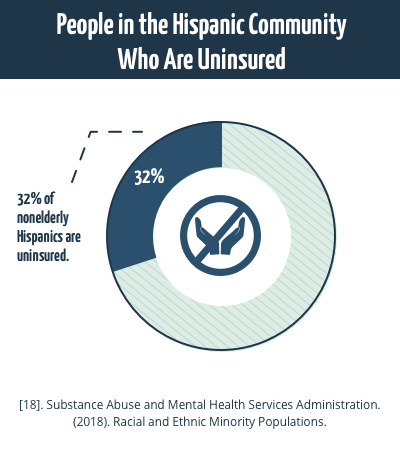 According to a report written by the Henry J. Kaiser Family Foundation, nonelderly Hispanics have the highest uninsured rate, with 32% lacking coverage, followed by American Indians/Alaska Natives (27%), blacks (21%), Asians/Pacific Islanders (18%), and whites (13%).10 This may be the result of a lack of employer-funded or other types of private health coverage, but even when a person has Medicaid, the gap is not completely eliminated. Lack of Hispanic providers or providers who are culturally competent. 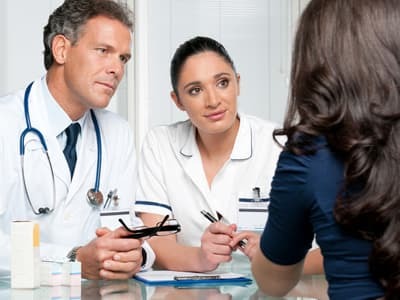 Knowledge of cultural differences and awareness of values that are important to members of the Hispanic community are essential when it comes to providing effective treatment.7 Even Spanish-speaking providers don’t always understand these concepts. Lack of familiarity with treatment. People may lack awareness of the available treatment options, payment possibilities, and access avenues. Tendency to rely on family. Hispanic Americans tend to involve family members (including a wide extended family network) in health care decisions. Additionally, they expect treatment providers to be warm and friendly and to inquire about their well-being and the well-being of their family.7 Sensing that providers don’t appreciate the current family dynamic may be off-putting. Detox programs. For many people, detox is the first step on the path to recovery. It is not a form of treatment but rather a process that aims to eliminate the substance from a person’s body while minimizing withdrawal symptoms. People may opt for medical detox, which offers medication and the intervention of professional medical staff, or social detox, which focuses on peer and social support, to help them through the withdrawal period. Inpatient programs. In this form of rehab, people live at a residential treatment center, generally between 30 and 90 days (sometimes longer). Inpatient rehab programs offer a wide range of therapies, such as individual and group counseling, family therapy, and 12-step groups. Outpatient programs. People who prefer to live at home may attend outpatient programs. Although they provide many of the same therapies, outpatient recovery programs are less intensive and lack the round-the-clock supervision of inpatient programs. People may attend treatment up to several times per week, depending on the level of care required. 12-step programs. Programs such as Narcotics Anonymous and Alcoholics Anonymous offer free support groups based on the 12 steps of recovery. People work through these steps with the assistance of a sponsor, draw strength from a higher power, share their experiences with the group, and gain support from others who have been in their shoes. Asking questions. When considering a substance abuse treatment program, ask questions: Are Spanish-speaking providers available? Does this organization frequently treat patients from multicultural backgrounds? Reading online reviews. Online reviews of substance abuse treatment programs provide information from program alumni about whether their cultural values were addressed and respected during the treatment process. Doing research. Call treatment programs or call the Substance Abuse and Mental Health Services Administration’s (SAMHSA) National Hotline at 1-800-662-HELP (4357). This hotline offers referrals to treatment programs and information in English and Spanish. They are available 24/7, 365 days a year. Talking to other people. Asking trusted friends and members of the community can provide insight about treatment programs. The SAMHSA Behavioral Health Treatment Services Locator. You may be able to find low-cost or free rehabs in your area on this website; you can also call the National Hotline at 1-800-662-HELP (4357). Public insurance programs. If you don’t already have insurance, you may be eligible for public programs such as Medicaid or Medicare. To determine your eligibility and to obtain assistance, you can visit the USA.gov website, HealthCare.gov website (forms are available in English and Spanish), Medicaid.gov website, or contact your state through this website. Additionally, the federal government has a variety of resources that can help you determine which state or federal programs you may be eligible for. Sliding scale or payment programs. Many rehabs know that the cost of treatment can prevent people from getting help. For this reason, some rehabs offer a sliding scale, in which the fee you are charged is based on your income and/or ability to pay. You are usually required to provide proof of income (such as pay stubs or proof of public assistance). Some rehabs may also offer payment programs, which may allow you to pay off the cost of treatment in installments. Rehab scholarships. A rehab scholarship or grant may offer a way for qualified people to pay for treatment. Some scholarships are offered by private programs, while others may be available through state-run programs. You can contact treatment centers directly to inquire about their forms of financial aid, or you can also call the SAMHSA hotline at 1-800-662-HELP (4357). The following resources may also be of assistance to those seeking culturally specific substance abuse treatment. Drogas, alcohol y VIH/SIDA: Una Guía para su salud (Drugs, Alcohol, and HIV/AIDS: A Guide for Your Health). This pamphlet explains the dangers of HIV transmission among people who use drugs and focuses on the importance of substance abuse treatment. El Tratamiento para el Abuso de las Drogas y el Alcohol (Alcohol and Drug Treatment: How it Works, and How It Can Help You). This pamphlet explains how substance abuse treatment works for people who are involved in the criminal justice system. Información sobre la Buprenorfina (The Facts about Buprenorphine for Treatment of Opioid Addiction). This pamphlet explains how the medication buprenorphine can help people struggling with addiction to opioid drugs. Información sobre la Naltrexona – 2011 (The Facts about Naltrexone for Treatment of Opioid Addiction). This pamphlet provides information about naltrexone, a medication that is also used to treat opioid addiction and alcohol addiction. 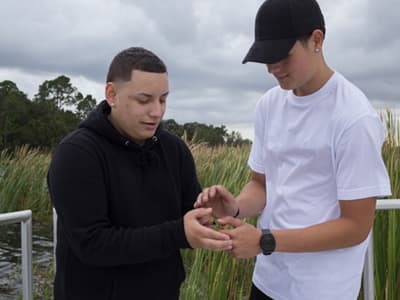 The National Latino Behavioral Health Association is an advocacy organization that strives to eliminate disparities in funding and access and improve the quality of services for Latinos. The National Alliance on Mental Illness offers information specific to Latino mental health. Mental Health America offers Spanish-language pamphlets and screening tools related to a wide range of mental health topics. Alvarez, J., Jason, L. A., Olson, B. D., Ferrari, J. R., & Davis, M. I. (2007). 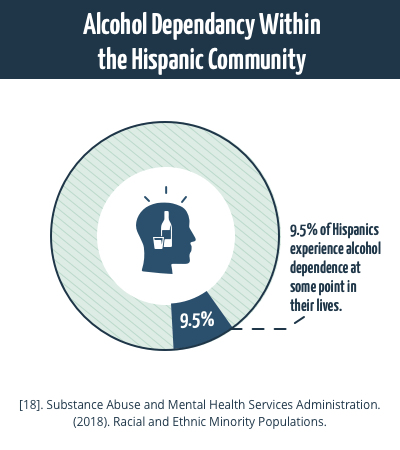 Substance abuse prevalence and treatment among Latinos and Latinas. Journal of Ethnicity in Substance Abuse, 6(2), 115-141. Rodriguez, C. (2013). 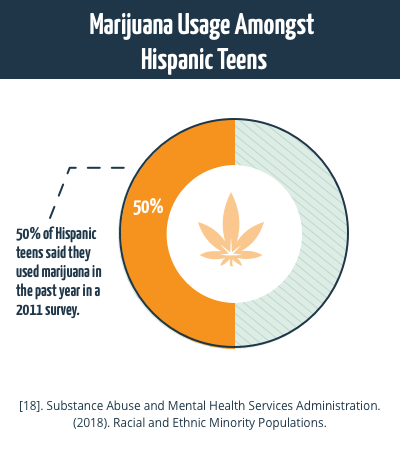 Hispanic teens more likely to use drugs, study says. CNN. National Institute on Alcohol Abuse and Alcoholism. (2015). Alcohol and the Hispanic community. Nelson, S. (2017). “Latinos got 77 percent of federal pot sentences last year.” U.S. News and World Report. National Institute on Alcohol Abuse and Alcoholism. Minority health and health disparities. Michigan State University. (2004). Report: US criminal justice system unfair, unjust for Hispanics. Flores, V. (2011). Cultural elements in treating Hispanic/Latino populations. Substance Abuse and Mental Health Services Administration. (2012). 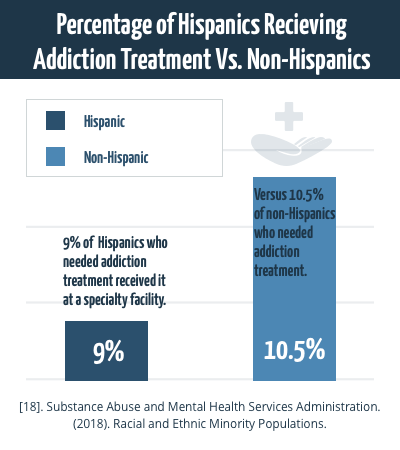 Need for and receipt of substance use treatment among Hispanics. Henry J. Kaiser Family Foundation. (2013). Health coverage by race and ethnicity: The potential impact of the Affordable Care Act. Pagano, A., & NIDA Postdoctoral Fellow. (2014). Barriers to drug abuse treatment for Latino migrants: Treatment providers’ perspectives. Journal of Ethnicity in Substance Abuse, 13(3), 273-287. Center for Substance Abuse Treatment. 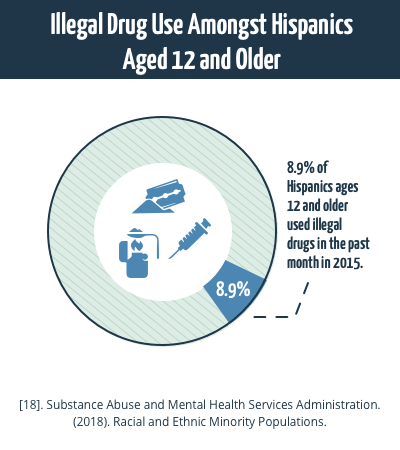 Drug abuse among Hispanics: A brief evidence-based guide for providers. Addiction Technology Transfer Center (ATTC) Network. (2015). Desk reference: Cultural elements in treating Hispanic and Latino populations. Center for Behavioral Health Statistics and Quality. (2012). Substance abuse facilities with services in Spanish are available in all regions for Hispanic clients admitted to treatment in 2010. Frank, R. & Salkever, D. (1994). Nonprofit organizations in the health sector. Journal of Economic Perspectives, 8(4), 129-144. The Partnership at Drugfree.org. (2012). The Partnership Attitude Tracking Study: Hispanic Teens and Parents.